The mission of the residency is to provide an opportunity to experience full-scope primary care optometry with a strong emphasis on vision therapy, developmental vision and neuro-rehabilitative optometric care. Our program will provide post-graduate clinical experience beyond that of the Doctor of Optometry program and its clinical externships. It will provide the education and management skills that are needed to excel in a private practice setting. Objective: The resident will develop a high degree of efficiency in the provision of primary eye and vision care services, particularly focused on pediatrics, strabismus and amblyopia; vision related learning problems, vision therapy and neuro-rehabilitation. Outcome: The resident will provide primary eye and specialized vision care services at any of our 3 sites, involving approximately 1500 patient encounters of which 50% will involve the areas of pediatrics, strabismus and amblyopia; vision related learning problems, vision therapy and neuro-rehabilitation. Measure: The resident will report the number of patient encounters of each type using the activity log. Goal 2: Develop the resident’s expertise in vision therapy and Neuro-rehab to a wide variety of patients. 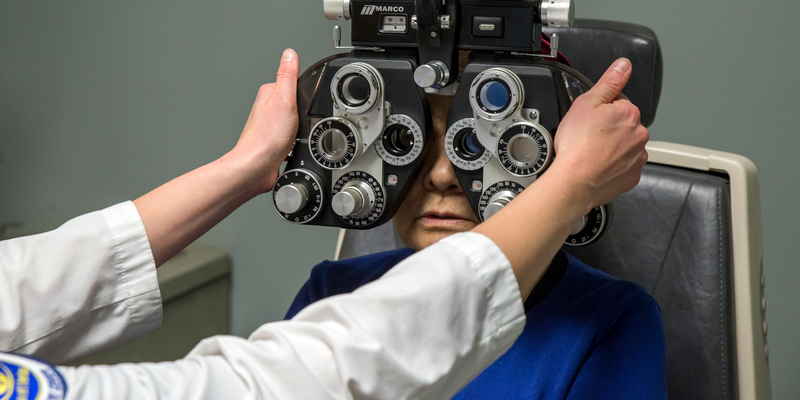 Objective: The resident will be involved in the decision making process to determine which patients will benefit from other services like optometric vision therapy, neuro-rehab therapy or return for further ocular health testing. Outcome: The resident will possess the ability to determine which patients will benefit from vision therapy/neuro-rehab therapy services or which patients require further testing for diagnosis and management of ocular disease. They will learn how to select and successfully perform proper vision therapy procedures at the appropriate level of complexity for the patient and as well as how to determine which patients require follow-up and referral to other professionals. Measure: The resident will be evaluated quarterly by the supervisor to determine if the appropriate diagnosis and treatment recommendations are being applied at the appropriate level. Objective 1: The resident will perform the appropriate diagnostic examination procedures, including visual fields, VEP, ERG, OCT and ocular photography as appropriate, which will improve their expertise as a clinician. Outcome: The resident will consistently select and successfully perform the proper diagnostic procedures as indicated for each patient. Measure: The resident will be evaluated quarterly by the supervisor to determine if the appropriate testing and interpretation is being followed. Objective 1: The resident will acquire additional knowledge in the diagnosis, management and co-management of systemic disease with particular emphasis on those with significant ocular manifestations such as trauma, stoke, hypertension and diabetes. The resident will also acquire additional knowledge in the diagnosis, management and treatment of ocular diseases such as glaucoma, macular degeneration, retinal disease and other primary eye care disease states. Outcome: The resident will evaluate at least 100 patients with systemic disease with ocular manifestations. Objective 2: The resident will develop knowledge in the diagnosis, management, and treatment of ocular diseases such as glaucoma, macular degeneration, retinal disease, dry eye, and other primary eye care disease states. Outcome: The resident will evaluate at least 100 patients with ocular disease. Outcome: The resident will present lectures during meetings of the clinic or other health care providers at least once per quarter. The resident will be trained to speak to OT groups, school nurses, teachers and parent groups on the relationship between vision and learning. Goal 6: Instill in the resident an appreciation of the importance of professional correspondence. Objective: Educate the resident in the preparation of proper inter-professional correspondence. Outcome: The resident will prepare professional reports to primary care doctors, medical specialists, neurologists in order to keep them apprised of the progress of patients in our neuro-rehab therapy program as well as patients in the primary care practice with ocular manifestations of systemic disease (Ex. diabetes). Measure: The resident will report monthly on the number of professional reports/letters sent using the activity log. Goal 7: Develop the skills necessary to provide inpatient care at several area rehabilitation hospitals. Objective: The resident will manage the care of in-patients rehabilitation hospitals. Resident will utilize special, handheld equipment (portable auto-refractor, slit lamp, tonometer, portable lens meter, etc.) to examine, diagnose and manage the treatment of patients with various neurological disorders ranging from stroke, to TBI to ALS to Parkinson’s disease. Outcome: The resident will manage the vision clinic at these facilities and will work closely with physiatrists, neurologists, and occupational therapists in order to manage the care of these patients and reduce their visual symptoms. The resident will evaluate at least 100 patients with ocular disease. Objective: The resident will develop a high degree of efficiency in the provision of primary eye and vision care services, particularly in the area of pediatrics, strabismus and amblyopia, vision related learning, vision therapy, and vision rehabilitation, for head trauma and stroke. Learning Activity: The resident will provide primary eye and vision care services involving approximately 1500 patient encounters, 50% of which will include both pediatric vision therapy cases and neuro-rehabilitation cases. These encounters will include but not be limited to: strabismus, amblyopia, binocular and accommodative dysfunctions, visual information processing dysfunctions, ADD/ADHD, autism spectrum and acquired brain injury. Outcome: The resident will develop enhanced skills in the management of primary eye care and unique vision care patients as mentioned above. Objective: The resident will develop a high degree of efficiency and skill in providing vision therapy services to a wide variety of patients. Learning activity: The resident will perform vision therapy and help direct our therapists in dealing with children struggling with vision related learning problems; patients with accommodative, binocular, and oculomotor dysfunctions; patients with strabismus and amblyopia; patients with autism spectrum, ADHD; and individuals recovering from acquired brain injury and stroke. Outcome: The resident will become proficient in providing and managing vision therapy services for a wide variety of patients in a private practice setting. Learning Activity: The resident will perform and/or interpret ophthalmic diagnostic tests that can include: VEP, ERG, internal and external ocular photography, OCT, and other tests, such as genetic testing for AMD. Objective: The resident will acquire additional knowledge in the diagnosis, management, and co-management of systemic disease with particular emphasis on those with significant ocular manifestations such as trauma, stroke, hypertension and diabetes. Learning Activity: The resident will present at least one lecture per quarter to the clinic or another staff/group including presentations on vision and learning to teachers, nurses and OT groups. Objective: The resident will engage in professional correspondence. Learning Activity: The resident will utilize electronic records to assist in the proper correspondence with other medical professionals. Outcome: The resident will develop the natural ability to quickly compose professional reports in an efficient manner. Objective: The resident will oversee the care or in-patients at 5 area rehabilitation hospitals. Learning Activity: The resident will visit these area hospitals weekly and will perform thorough examinations utilizing unique handheld equipment. They will ultimately work with OT’s, neurologists, and physiatrists to manage the visual symptoms and eye health of the patients under their care. Outcome: The resident will develop the ability to use special equipment and gain experience in dealing with patients with acute neurological injuries and degenerative conditions. They will learn to work with other medical providers as “part of the rehab team” in an effort to improve the quality of life of each of these patients. G. A personal interview is required at MVC Eye Care. A telephone interview is an option. H. Southern College of Optometry affirms that no person shall be excluded from participation in, be denied the benefits of, or be subjected to discrimination under any program or activity at or affiliated with Southern College of Optometry on the basis of race, color, creed, religion, gender, age, disability, or national origin. Each residency is one calendar year in length, commencing July 1st. The resident is eligible for thirteen days annual, sick, or personal leave. The resident is also eligible for approved educational leave to attend approved professional meetings. Annual and educational leave is granted with prior approval of the Supervisor in conjunction with the SCO Director of Residency Programs. A. The resident is defined as an employee of MVC Eye Care and the residency stipend is paid by MVC Eye Care. No tuition or fees are applicable. B. The resident should apply for optometric license in New Hampshire and complete the NH written examination prior to the beginning of the residency. C. Professional liability protection for residents for professional activity performed at MVC Eye Care and any area rehab facilities is provided by MVC Eye Care. E. Resident privileges will be determined by MVC Eye Care. Resident will be expected to provide services at all 3 MVC Eye Care owned practices. Placement will be at the sole discretion of the residency supervisor. A. The resident is required to deliver clinical services at a level that is satisfactory to the Residency Supervisor, Director of Residency Programs, and the SCO and MVC Eye Care. Normal clinic hours are from 8:00 A.M. until patient care is completed, usually around 5:00 P.M., Mondays, Wednesdays and Fridays. Tuesday hours are from 9:00AM until 6:00PM. Thursdays are reserved for external rehab hospital visits. These hours are dictated by the facilities, but usually begin at 8:30 and end by 5PM.In the event that rehab hours are cancelled due to low hospital census, resident will report to clinic from 9:00 AM until 6:00 PM. Saturday hours are required 2 to 3 Saturdays per month from 9:00AM until 1:00PM. The resident is expected to be present in the clinic during all scheduled working hours, except when attending or delivering lectures or attending approved education. The resident may occasionally be required to be on call. B. The resident is required to keep a record of patient contacts. This can be easily done through our EMR system. The Supervisor of the Residency Program and the Director of Residency Programs will review the resident’s activity periodically. E. The resident is expected to perform in a professional manner in the delivery of patient care services and to observe those proprieties of conduct and courtesies that are consistent with the rules and regulations governing MVC Eye Care and Southern College of Optometry Residency Programs. H. Any resident accepted for training can be dismissed, without receiving a certificate of completion, for infractions of the rules and regulations of MVC Eye Care or those set forth by Southern College of Optometry, or for any action which jeopardizes the safety of patients, personnel, or physical facilities. A residency stipend will be provided for the year of training paid by the clinic. The stipend is currently $42,500. Compensation is not contingent upon productivity of the resident. Additional benefits such as FICA and professional liability insurance are also funded by the clinic. The resident will have the opportunity to receive up to $250 per month to purchase personal health insurance. The residency program at MVC Eye Care is fully accredited by the ACOE, 243 N. Lindbergh Blvd., St. Louis, MO 63141, 314-991-4100.